Tonight I dined for the first time at Ten Asian Bistro, located in of all place, the Trumbull Mall. Ten just recently opened, so I have been looking forward to trying it as I am a lover of Asian Cuisine. I must admit, I was extremely pleasantly surprised. 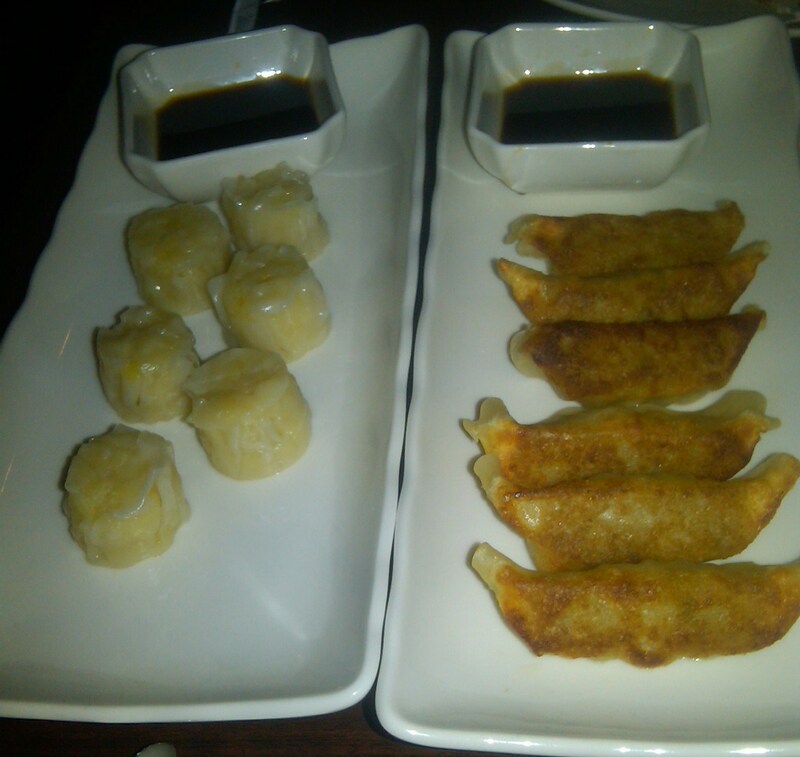 We started off with a selection of many different dumplings for our appetizer. We had four different types of dumplings: Shumai (steamed shrimp dumpling, far left), Gyoza (fried beef dumpling, center), Dim Sum (steamed pork and shrimp dumpling, far right), and a Fried Duck Dumpling (served with a soy ginger glaze, not pictured). I don’t know about you, but dumplings are one of my favorite types of food…. so flavorful and great for tastings. The Dim Sum and Shumai were among the better dumplings I have had. The Dim Sum was extremely flavorful, yet rich and heavy. 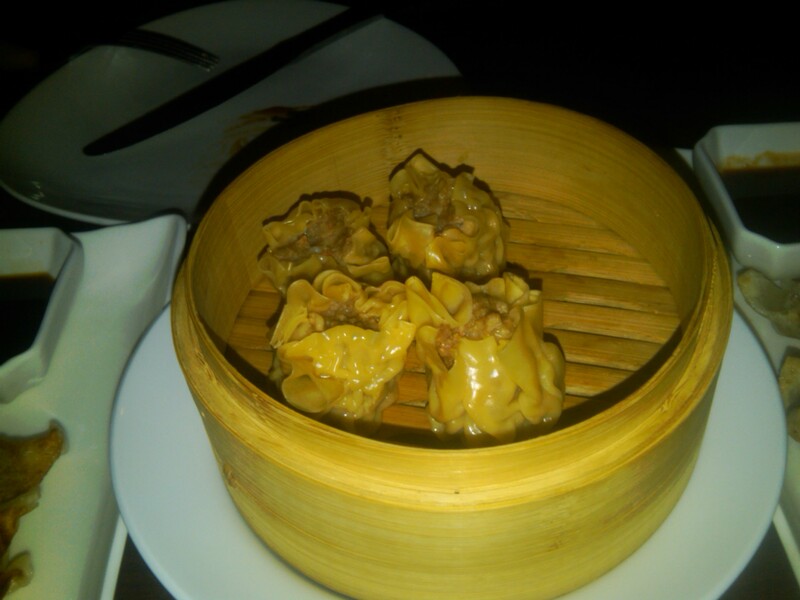 The Shumai had a beautiful sweetness and were perfectly cooked. The Duck Dumplings were something very different. I had only had Duck Dumplings one other time (at Rickshaw Dumpling Bar) and was not impressed there. At Ten, they were delicious. 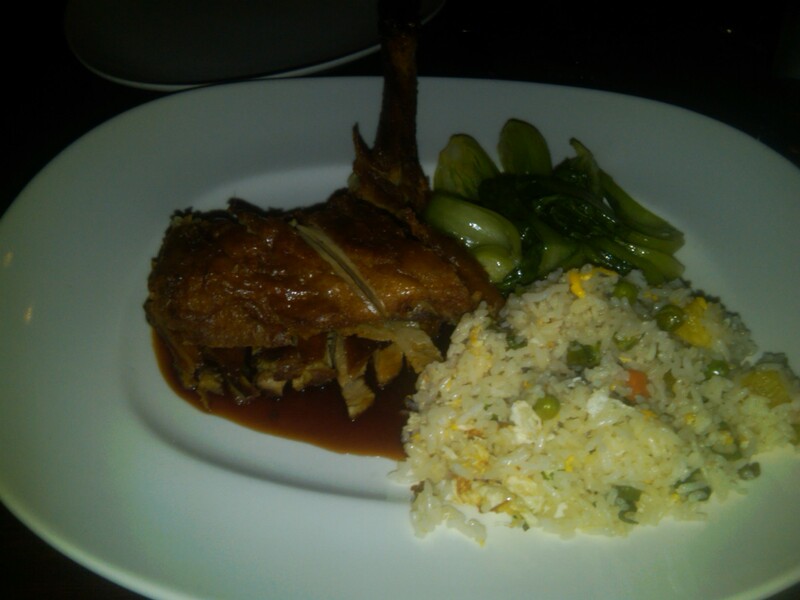 You could taste the fatty goodness of the duck and the soy ginger glaze complemented it well. The Gyoza was tasty, but a little bit bland for my taste. They were perfectly cooked and enjoyable, but I would have liked a bit more seasoning. Overall, the starters were a delight, and extremely filling. Why we ordered four appetizers for two of us? Because they looked, and turns out tasted, fantastic. Next came the entrees! We had Beef Lo Mein and Crispy Duck with Pineapple Fried Rice. 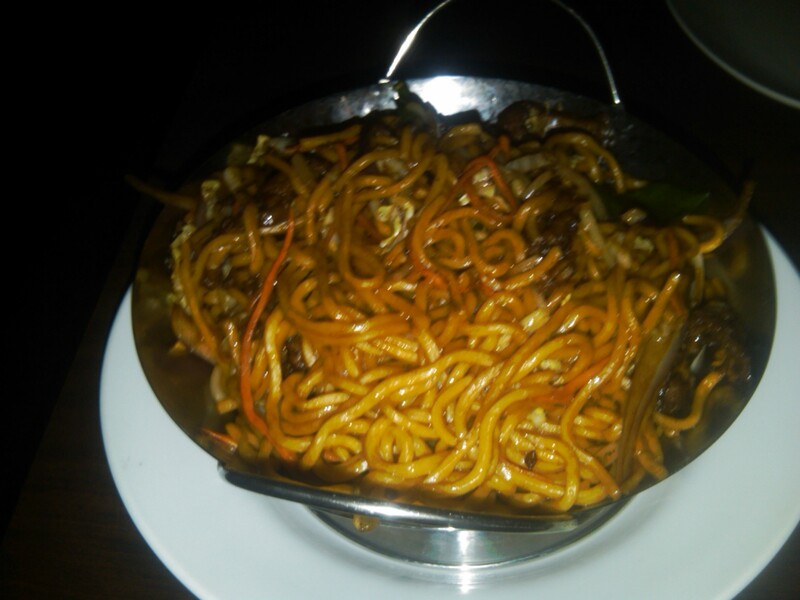 The Lo Mein was excellent… flavorful, well cooked, and large portion. However, the star of the entire meal was the duck! To begin with, the Bok Choy, of which I am usually not a huge fan, was phenomenal. Very simply, yet elegantly prepared by being sauteed in some garlic with a bit of ginger and soy. Add to that a quite tasty pineapple fried rice, and you have two wonderful sides. But the DUCK!!! This was the best prepared piece of duck I have had that I did not prepare myself or was not a duck confit. The skin was perfectly crisp, and yet the meat was tender, flavorful, rich, and quite simply delicious. Finally, what meal would be complete without the dessert. While the waitress recommended the Tempura Ice Cream (usually one of my favorites), I was drawn to a trio of chocolate. 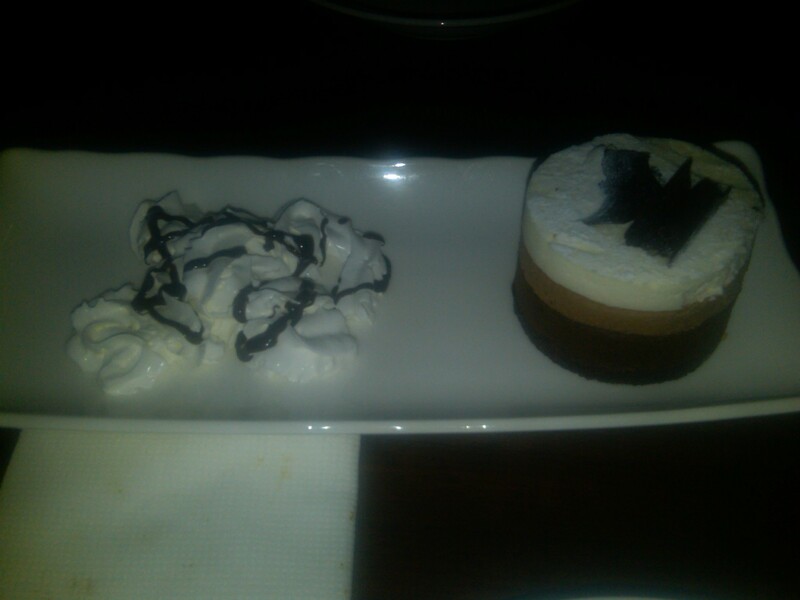 I will say, I was misled by the description of the dessert. It was described as a dark chocolate ganache, milk chocolate mousse, and white chocolate mousse topped with dark chocolate shavings. I was expecting a trio, kind of like a tasting plate of the three different chocolates. What I got? Something similar to a chocolate terrine. Don’t get me wrong, it was well made, tasty, and a great end to a meal I look forward to having again, just not what I expected. The whipped cream was a bit messy when it came to the plating, but that did not deter us from finishing the whole thing. Overall, the food consisted of many shining stars and I look forward to my return visit. My one complaint, while the internal atmosphere was very nice, elegant, and enjoyable… as you look out the main window, since it is in the mall, you see a mall hallway and a bright Ruby Tuesdays sign. In the end, that did not matter in the least. I highly suggest giving Ten Asian Bistro a try. Let me know what you think. 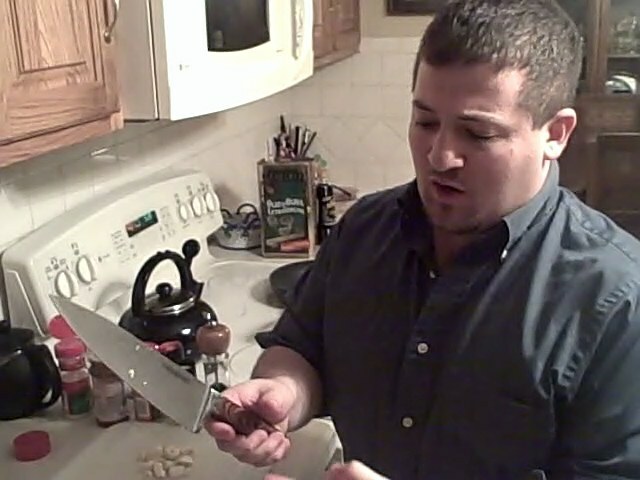 One of my favorite tricks… The too much pasta sauce in too little time dilemma! I don’t know about you guys, but I absolutely love pasta. However, I have become spoiled and only eat homemade sauce. Making sauce tends to be a long process so I usually make extremely large batches and freeze it in separate containers. These containers tend to be enough sauce for at the very least feeding 6-8 people pasta, usually more. This creates a problem… sometimes it is just me or me and one other person AND sometimes I don’t have time to defrost a container of sauce, yet make a whole new batch, so I developed a really quick 15 minute pasta sauce that is absolutely divine. You ready? First the ingredients: Extra Virgin Olive Oil, 1 small can tomato paste, 2 ripe tomatoes or 1 carton of ripe cherry tomatoes, 1 onion, 1 Bay leaf, 2 fresh basil leaves, 2 fresh sprigs of rosemary, 4 segments of garlic clove, 1 habanero pepper, garlic powder, a bottle of Bordeaux (optional). That’s it! Nice and easy. Now for the process. Welcome to the culinary journey of an attorney/actor/chef /stand-up comic/waiter/singer that simply loves food. I hope you enjoy joining me as we try different restaurants, recipes, and simply explore the art that is food. Above check out me carving a freshly smoked turkey (on the left) and a plate of a Mexican inspired pulled pork with a duo of BBQ sauces (a mole BBQ and a peach/apricot habanero BBQ) along with a shot of watermelon, vodka, and mint gazpacho. Talk to you all soon! An be sure to follow the blog to keep up on all the latest adventures.